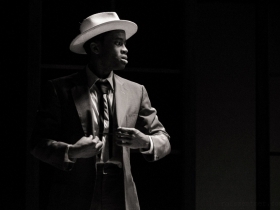 Renaissance production captures the joys and tragic end of the teen whose death inspired civil rights activists. The Ballad Of Emmett Till. Photo by Ross E. Zentner. It is a well-known story — a motivating landmark in the civil rights struggle just prior to Dr. Martin Luther King. It is an unknown new play using the music, movement and language of black urban and rural lifestyles of the 1950s. 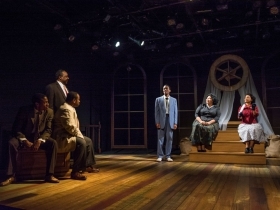 But by creating rotating family personas, both city and country, and providing a unique opportunity for a busy ensemble of six (with an orchestra of three hidden behind the scrim) writer and theater artist Ifa Bayeza has made The Ballad of Emmett Till theatrically compelling. The dictionary says an elegy has to be sad. But this is an elegy largely without lament — a lively celebration of youthful vitality, its shadows never ignored but left hovering until the finale. As the headlines of today continue to demonstrate, it is how a racial incident that could be just another statistic gains lasting humanity through the perseverance of family ties, which in this case grew to universal outrage. Without his mother’s determination, Emmett Till would have been just one of those nameless Jim Crow statistics – a Chicago 14-year-old visiting relatives in Mississippi who smiled (or maybe just stuttered) at a white woman and was dragged away to be beaten, shot and dumped in the river. Bayeza has fleshed out biographical details, but we really know about Emmett because his mother refused to forget, insisting on opening his coffin in 1955 and displaying his mutilated body in photos. Forty years before the rise of the Internet, the image of the boy in the coffin went viral. It remains an iconic moment in the struggle for civil rights. All that powerful history might tempt patrons to pat themselves on the back for how far we’ve come (or have we?) or avoid the play altogether to try and forget such a shameful past. But Bayeza, while recognizing that Emmett’s ballad is a chronicle full of foreshadowing, has determined to bring him and the times to vibrant life. Emmett in his barely contained enthusiasm for showing off is as familiar as a high school playmate, the lovable intruding adolescent we know and joke about or maybe were — a boy eager to be a man and show off for the ladies, loving and tricking his mama into giving him more freedom, constantly talking despite his stutter, enamored of flashy clothes and dance steps. To keep us engaged requires an understanding actor who can move Emmett from a lost father and once crippling polio to outrageous joy in his own impulsive chatter and longing for new adventures. 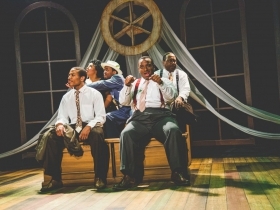 In Marques Causey, this Renaissance Theaterworks production through November 15 has that actor – good enough to avoid stereotype, playing younger than his actual years, imbuing the part with adolescent thoughts and desires. Under director Marti Gobel, Causey has gotten inside every twitch, look and slide. 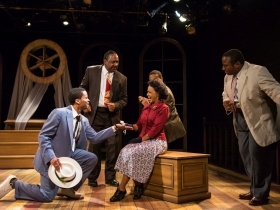 He is only stymied, as any actor would be, by Bayeza’s conclusion, that doesn’t know quite how to say goodbye to the life, poetic crucifixion and rebirth of Emmett Till. 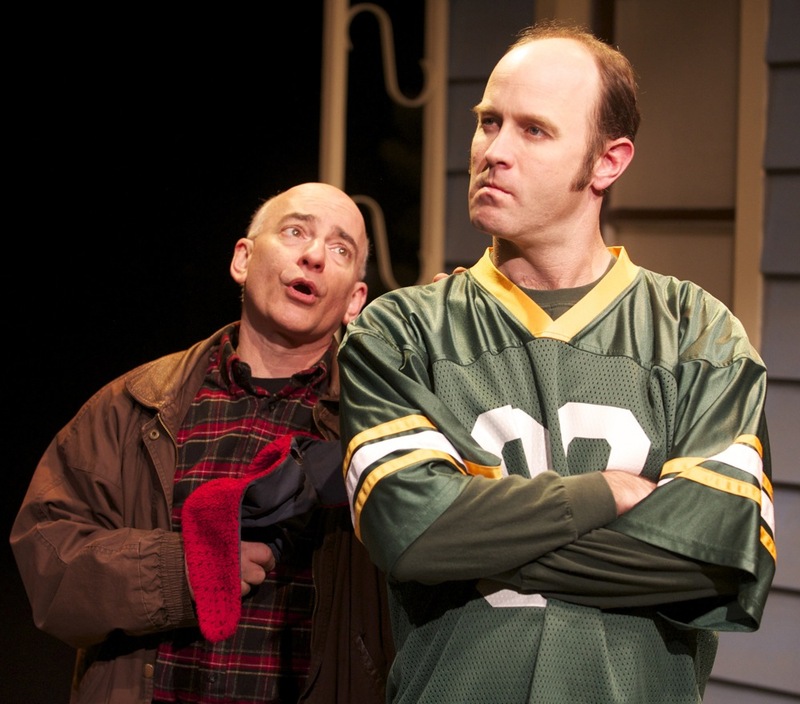 This is the place where the play asks too much emotionalism from its cast without sufficient depth of dialog. It’s here the play relies too heavily on what the audience wants to feel rather than earning those feelings. But that comes after captivating us. 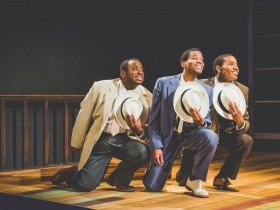 The ensemble has to sing, dance, overlap dialog and create characters around Till – relatives and friends or fleeting acquaintances, as well as set movers, at times making us smile at their humor and subtlety. Some of the problems are in the play but some are from the director, a talented actress herself. Gobel does skilled work in coordinating movement and gestures, but should have seen moments when the ensemble is being overused and just backed away. All the actors, though, do have innovative moments – Derrion Brown, James Carrington, Ericka Wade as the mother particularly and Marvette Knight in constant versatility. There is a particularly wonderful soliloquy from Allen D. Edge as the homespun preacher. It is a sequence also featuring some of Bayeza’s best writing as he looks down at the sleeping Till and talks about impetuous youth and dreams gone by. The patrons grasp for a moment something otherwise almost unfathomable: How a caring older black relative could be so crushed into complacency by the realities of white supremacy. Madelyn Yee seeks to combine abstract and functional scenic design as wheel, white fabric and brown burlap sacks convert into home, farm, cotton fields, and dinner-table coffin. It’s inventive in thought, but time consuming to manipulate. The power of the ensemble and tableaus made much of it unneeded. Renaissance, again using the shoebox studio space at the Broadway Theater Center, keeps making its mark favoring works by or about women but also, like this one, about moments of human resonance. The lapses singled out are not debilitating to this production. In fact, this is a showcase of our Midwest-based artists and how productions like this should expand the current theater audience. Many socially attuned grownups and high school students who don’t think of local theater would be haunted by this show. They would also appreciate the almost subliminal blues and jazz pop punctuation of Jahmes Finlayson, drums, John Nicholson, guitar, and Brian Bauman, harmonica. Dominique Paul Noth served for decades as film and drama critic, later senior editor for features at the Milwaukee Journal. You can find his blog here and here.